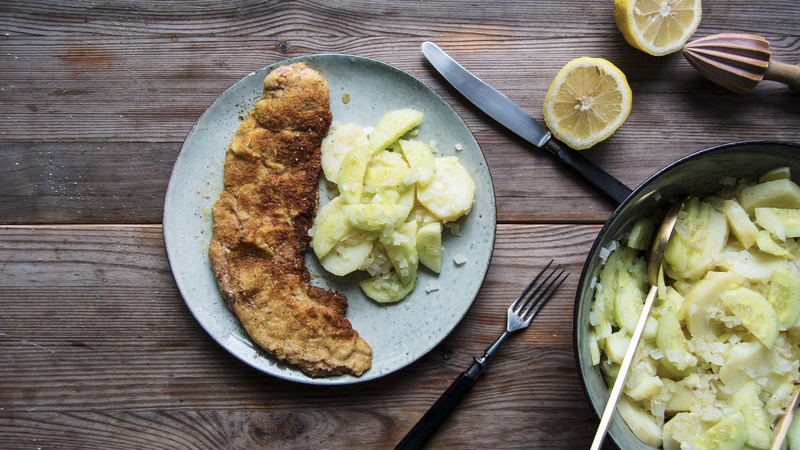 Schnitzel and potato salad are two German classics, and it's not hard to see why. Done right, the “perfect schnitzel is thin and juicy, with a golden crust that flakes off the meat in light, crispy waves,” say Peters, while the potato salad provides a light, fruity counterpoint. For the potato salad, bring the vinegar, water, and onion to a boil in a small saucepan. Lower the heat and simmer for about 3 minutes or until the onion is tender. Remove from the heat, cover, and let sit for 5 minutes. In a large bowl, toss together the potatoes, cucumber, olive oil, and the onion–vinegar mixture. Season to taste with salt and pepper. If the salad is too dry, add more olive oil and vinegar. You can prepare the salad a few hours in advance—it will soften and the flavours will deepen. On a table or countertop, arrange the veal or pork between 2 sheets of plastic wrap. Use a meat pounder or your fist to tenderise and slightly flatten the meat. In a large, heavy pan, heat 2 tablespoons of butter and a generous splash of sunflower oil over high heat. Place the flour, eggs, and breadcrumbs in 3 separate deep, wide plates. Season the meat on both sides with salt and pepper. Lightly dredge the meat in the flour then dip it in the egg and dredge it in the breadcrumbs, making sure it's evenly covered. Only prepare as much as you can fit in your pan without overcrowding. Immediately place the meat in the hot pan. Lower the heat to medium-high and cook, turning, for 1 to 2 minutes per side or until golden brown and just cooked through. If the pan gets dry, add more oil. Transfer the schnitzel to a plate, season to taste with salt and pepper, cover, and keep warm. Add more oil and butter to the pan and cook any remaining meat. Serve the schnitzel with a squeeze of lemon juice and the potato salad.